WASHINGTON, DC (June 15, 2016)—Construction fences are up and site work is underway for a new and expanded International Spy Museum (SPY) in the nation’s capital. Preparations recently began as SPY and The JBG Companies reached agreement to relocate the Museum to a newly constructed building at L’Enfant Plaza—between the National Mall and the Southwest Waterfront’s Wharf. This new facility will serve as an immediate and multi-faceted catalyst for transformation—not only for SPY, but also for the L’Enfant Plaza and 10th Street, part of the long-term vision for the Southwest Ecodistrict. The District has been working with the Cleveland-based Malrite Company for more than a year to ensure the Museum stays in the District. Milton Maltz, the founder of The Malrite Company, created and founded SPY. The JBG Companies, owner of the majority of L’Enfant Plaza, will act as the owner’s representative during the construction period. The Malrite Company and JBG collaborated extensively on plans for the new 140,000-square-foot facility, which will sit directly in front of the glass atrium on the Plaza. Renowned London-based architects Rogers Stirk Harbour + Partners created a design for the iconic building that will have a distinct and dynamic identity.Washington-based Hickok Cole Architects will be the architect of record for the project. Design features include a glass “veil” suspended in front of an enclosed “black box” exhibition space that will allow the movement of people to be visible from both inside and outside, contributing to new energy along 10th Street. This sense of veil and black box reflects the Museum’s espionage-related themes of secrets revealed and hiding in plain sight. The new building significantly expands exhibit and educational space and adds an intimate theater along with unique event spaces. 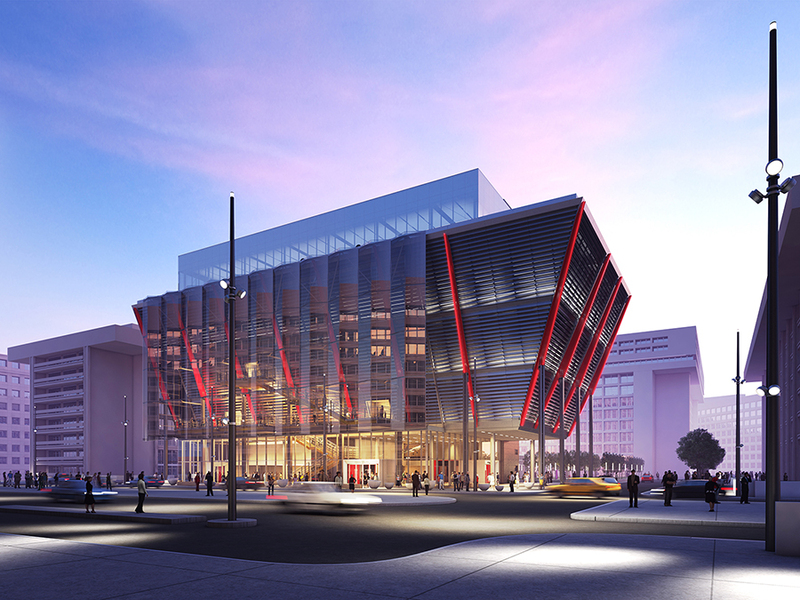 The SPY development at L’Enfant Plaza is expected to create more than 300 construction jobs. Additionally, the new and larger Museum is expected to generate a 20 percent increase in staff over its current location. The new building is expected to open spring 2018. The International Spy Museum continues to operate at 800 F Street NW, showcasing the world’s largest collection of international espionage-related artifacts on public display. Its latest interactive exhibition Exquisitely Evil: 50 Years of Bond Villains has been a phenomenal draw. The International Spy Museum, a 501(c)(3) private non-profit, is the only public museum in the United States solely dedicated to the tradecraft, history, and contemporary role of espionage and intelligence. Open since July 2002, the Museum features the largest collection of international espionage artifacts ever placed on public display. The mission of the International Spy Museum is to educate the public about espionage and intelligence in an engaging way and to provide a context that fosters understanding of their important role and impact on current and historic events. The Museum’s collection chronicles the history of espionage, from its inception, to the modern day challenges facing intelligence professionals worldwide in the 21st Century. For more information, please visit spymuseum.org. The Museum is distinguished by its Board of Directors and Advisory Board including: Milton and Tamar Maltz, Founders of the International Spy Museum, General Michael V. Hayden, former Director of both NSA and CIA; H. Keith Melton, Historian and Advisor to the US Intelligence Community; David Kahn, the world’s leading expert in the history of cryptology; Major General Oleg Kalugin, KGB (Ret. ); Melissa Boyle Mahle, CIA (Ret. ); David Major, FBI (Ret. ); Antonio Mendez, CIA (Ret. ); Jonna Mendez, CIA (Ret. ); Malcolm Nance, US Navy (Ret. ); Dame Stella Rimington, the first female Director General of MI5, The Honorable William H. Webster, the only person to head both FBI and CIA; and Ambassador R. James Woolsey, former Director of Central Intelligence. Headquartered in Chevy Chase, Maryland, The JBG Companies is a private real estate investment firm that develops, owns and manages office, residential, hotel and retail properties. The company has more than $10 billion in assets under management and development in the Washington, DC area. Since 1960, JBG has been active in areas where it invests, striving to positively impact local communities. For more information, please visit JBG.com or find us on Twitter @TheJBGCompanies and Facebook www.facebook.com/TheJBGCompanies.